The design is so simple that it’s less time to cobble one together than to drive out to the pet store to buy one! An enclosed box helps keep odor down and keeps your cat from scattering litter all over the place. And the lid comes off in an instant so you can scoop those turds! 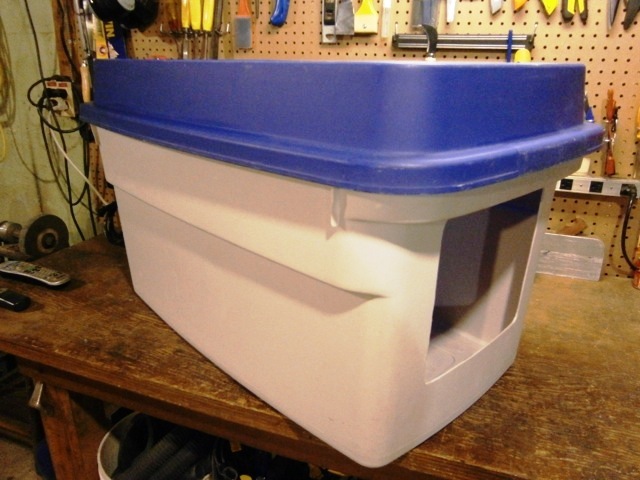 Air holes in the lid improve ventilation AND can be coupled with a non-modded bucket for an emergency cat carrier. Never put a cat in a bucket that doesn’t have airholes! This cat is chilling out in a 5 gallon bucket. As you can see it’s a bit tight in there. Cats love tiny spaces but not when they’re trying to take a dump. Simon used 18 gallon Sterlite Totes like these from Amazon. 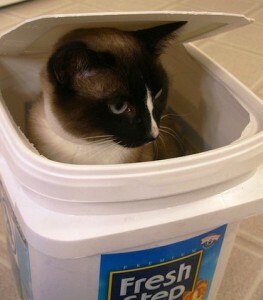 For cats below a certain size, you can use bins as small as 10 gallons. I use 4-5 inches of litter in my “rubbermaid” container. I cut a large hole in the middle of the “rubbermaid lid. large enough based on cat size, The remainder of lid allowed cats a platform to jump up on , then go down.